When Rich McConaughey comes back to town, divorce papers in hand, he’s in for more than he bargained for. Lisa Young, the woman he was married to for six months, hasn’t changed a bit. His mother has though… she’s gone from matronly to meow, and his father has taken off with the secretary. Does anything last anymore? Patty Froese lives in central Canada where the winters are long and cold--giving her excellent excuse to stay in and write without guilt. She's a tea drinker, a novel writer, an adoring wife and mom, and she's pretty sure she's a British person born in a shivering, Canadian body. She loves rain, royalty, pretty knick knacks and three square meals a day. No dieting here! If you'd like to find her online, come by her blog: http://pattyfroese.com. She's also on Facebook: http://www.facebook.com/pattyfroese, and whenever someone gives her a new like or follows her blog, she sighs in delight. 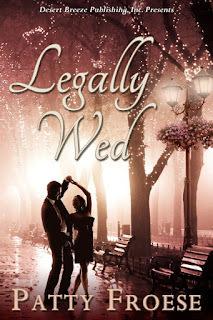 Legally Wed is her ninth novel to be released.